Click here to design your door! Make an entrance! Beautiful, secure doors. Whether you call it an entrance door, a front door, or indeed a back door, an exterior door is more than just a rectangle with a hinge! Seen from a distance, it’s the sign that you’re nearly home. It’s both a welcome to visitors and a barrier against intruders and noise. 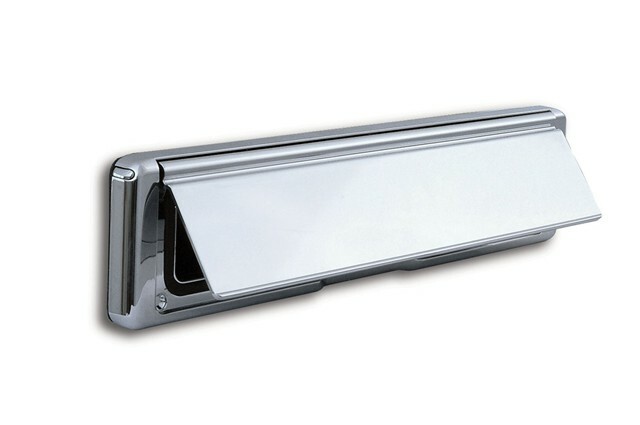 And, of course, it keeps unpleasant weather out and helps keep heat in - both of which help reduce your energy bills. But your entrance door is part of your home’s character and identity, too, and must fit with it. 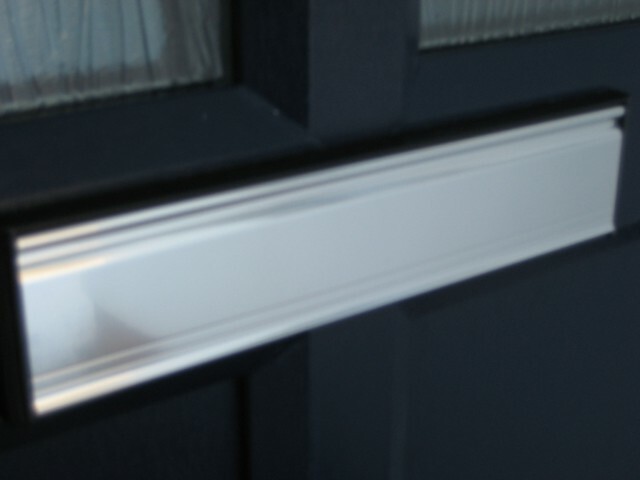 Since 2002, our extensive choice of modern, contemporary and classical styles of UPVC and composite doors has been delighting our customers with low-maintenance aesthetic appeal as well as with functional toughness – including robust outer skin, timber and ridged foam core, multi-point locking and security beading to prevent forced entry, and much more. Why you get your doors from us? Security - Our handles, hinges and locks have been rigorously tested to the standards of the official UK Police initiative Secured by Design. 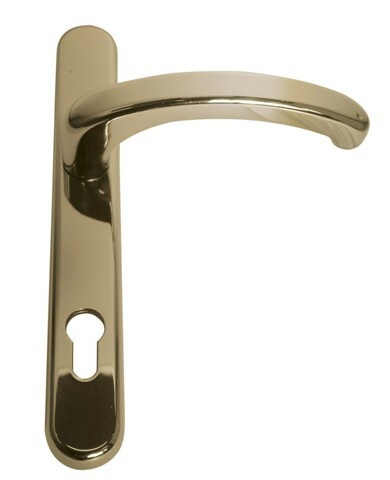 They feature a range of security innovations, including anti-bump and anti-pick cylinders, anti-snap cylinder guards, and the largest security hooks on the market! Longevity - Our doors, whatever style, finish or colour you choose them in (and we have many) meet the PAS 24 standard, which inspects, amongst other qualities, the door’s operation and strength, and weather-tightness. And if that’s not evidence enough of their resilience, they come with a ten-year guarantee against warping, cracking and discolouration. Accessibility - Available with three different types of threshold, our doors provide easy access for everyone, compliant with Part M of the UK Building Regulations and the Disability Discrimination Act (DDA). 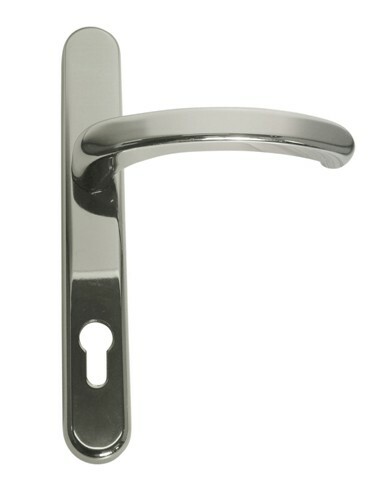 We can also fit doors to open inward or outward, to suit your accessibility needs. Heat and energy efficiency - A traditional all-timber door is up to ten times less thermally efficient than one of our UPVC or composite doors! 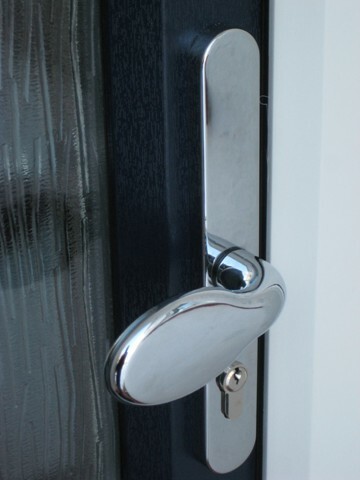 In addition, our composite doors remain stable during heat changes, which prevents cold spots from developing. 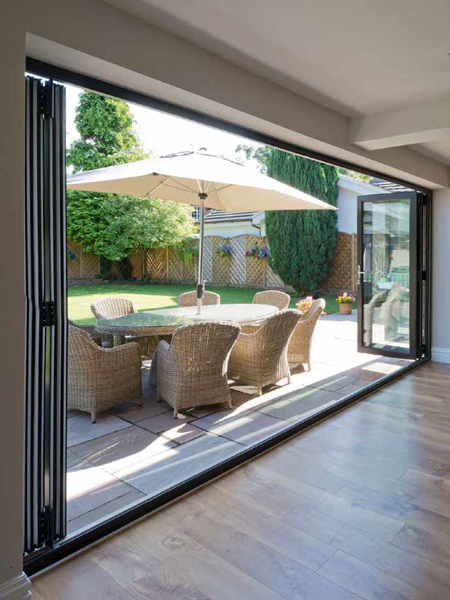 All of our front and back doors exceed the 1.8W/(m2.K) energy efficiency rating required by UK Building Regulations, so when you get a door from us, you immediately start to close down those high energy bills! But it’s not all about the doors – it’s about the quality of service, too. We’re not a subcontractor paid commission per installation – we’re a long-established family firm and we’d rather deliver quality than quantity (because we know that’s what brings customers to our door). You can choose your entrance doors from two different construction types – UPVC or composite – and in many different colours and finishes. Here's a very quick guide. UPVC (unplasticised polyvinyl chloride – sometimes known as PVC-U) is a tough, synthetic material whose rigidity makes it a natural choice for external structures like doors, windows and conservatories. Unlike timber, UPVC doors won’t crumble or rot, so they’ll resist the weather and keep out the noise for a very long time. Typically only 28mm thick, they also offer excellent security and protection but are light enough to be operated easily. Composite doors are made from a combination of materials that are pressed and glued together under high pressure, including UPVC, wood, insulating foam and super-tough glass-reinforced plastic (GRP). GRP is the material used to make lifeboat hulls, so you can bet that this combination is highly resilient and weatherproof all times! And at 44mm thickness, with its accompanying super-strong structural frame, it offers greater security against jemmying and intrusion, too. 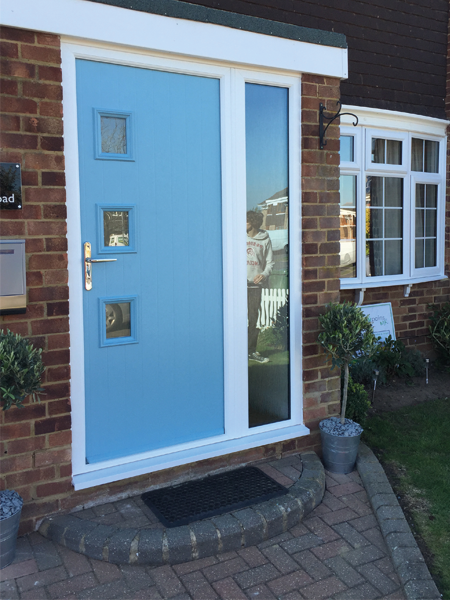 Colours to suit every taste – With colours on offer from Light Oak to Rosewood, Duck Egg Blue to Anthracite Grey, and many more besides (just ask us for what you want), the days of non-timber entrance doors being available only in white or brown are long gone! Fitting finishes – Is understated matt your preferred ‘house style’? Or would handsome woodgrain – a respectful nod to the timber doors of yesteryear – be the look that suits? Either way, we’ve got the door you want. 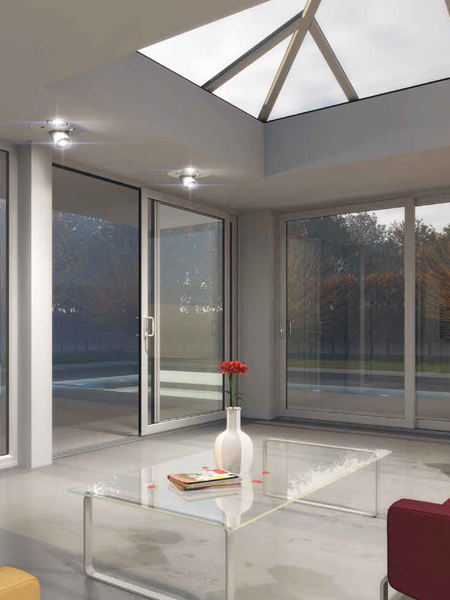 Highest-quality glass – Double-glazed, triple-glazed, decorative, etched, textured, obscure - however you want your door to let light in, our doors feature quality glazing from Pilkington and others, laminated for additional security. We’ve talked about construction, colour and finish – but what about style? You’ve worked hard to give your home the look it’s got, and you want to be sure the door you choose does it justice. There are literally hundreds of styles of entrance door, both UPVC and composite, each one conveying a slightly different look ranging from classical, to contemporary, to modern. You can tell a lot from the name. Styles like York, Cambridge, Windsor, Georgian and Tudor convey tradition; Cottage echoes rural homeliness, Verona adds an off-centre Continental twist. But the look doesn’t stop with the door itself. The door furniture (handles, knockers, letterplates, even drip bars) and the glazing all add aesthetic touches that can be transformative. 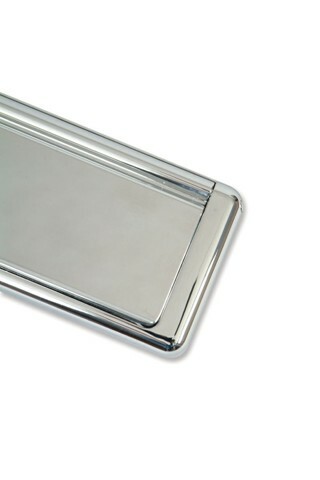 We’re proud to work with suppliers that know doors and everything that goes with them. You can find lots more detail on the styles and models of their UPVC and composite doors in their brochures. 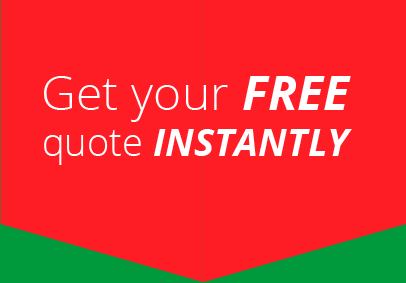 To learn more about how our UPVC and composite doors, expertly installed by a long-established and respected family business, can help make your home a more energy-efficient, secure, and noise-resistant place, get in touch or request a quote.